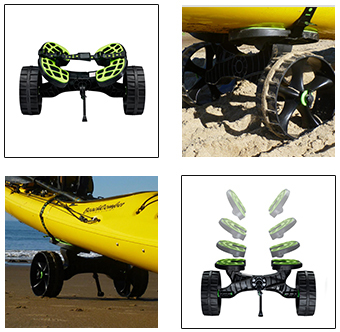 Take to the water and embrace the adventure with RAILBLAZA’s C-Tug kayak and canoe cart. No other cart on the market offers the same reliability and features. Designed and manufactured in Napier, New Zealand, the C-Tug kayak and canoe cart continues to amaze sport enthusiasts with its rugged appeal and incredible strength. The cart can carry up to 260 lbs., dismantles easily and doesn’t rust.The non-corroding engineering polymers and stainless-steel reinforced axels allow you to launch anywhere while the durable, puncture-free wheels and simple storage capability ensure that the C-Tug cart won’t let your grounded watercraft leave you high and dry. Interested in carrying C-Tug products? Contact Us.